Image-guided surgery is one of the most significant advances in endoscopic sinus surgery since the inception of the endoscopic approach in the mid-1980s. This technology enables the surgeon to follow the anatomic dissection of the sinuses on a computer monitor in the operating room in real time. Difficult anatomic relationships can more easily be understood and treated with the assurance that the critical landmarks are secured. Although the initial expense is substantial, these procedures have minimal per-case costs. The decision whether to use an optical or an electromagnetic system is less critical than the decision to use computer technology. Both systems are widely accepted and provide excellent anatomic information. IGS should not be considered as a way to palliate lack of experience or understanding of sinonasal surgical anatomy but rather as an adjunctive tool designed for otolaryngologists properly trained in ESS. IGS begins with obtaining a CT scan. The CT scan acquisition protocol used for the authors' needs consists of a helical, 2-mm–thickness axial CT scan with the use of a specially designed headset incorporating built-in metallic fiducial land marking. The specially designed headset allows automatic registration of the imaging to the patient's anatomy in the operating room. The imaging data set is transferred via optical disk, CD-ROM, or computer network to the operating room, where it is loaded into the workstation. The images are brought up on the IGS system prior to the procedure and checked for image quality and accuracy. An image depicting image-guided surgery is shown below. Verification of accuracy using patient anatomical landmarks. Today, most CT scanners provide data sets compatible with commonly used guidance systems. Radiology also has the ability to provide the required data on a CD-ROM, or to transfer the images directly from the radiology station to the IGS system through a secured broadband network. These advances, as well as the decreasing cost of the technology, have allowed IGS to be available to a sizable number of otolaryngologists. To date, in the authors' institution, more than 1000 computer-assisted ESS procedures have been performed over a period of 10 years. Currently, the time from anesthesia induction until completion of registration is less than 5 minutes. Registration generates a correlation between the position of the instrument in the surgical field and the corresponding location on the CT images. The instruments are registered to show their position with respect to the orthogonal CT images of the patient. The location is materialized by a set of cross hairs on the screen that moves through the CT image data in concordance with the movement of the pointer. Image-guided surgery, using either of the most recent optical or electromagnetic systems, accommodates for head movement. This has enormous implications for surgeons who prefer local or intravenous sedation. Prior to the advent of the new systems, general anesthesia was necessary to ensure absolute fixation of the head relative to the tracking system (see the first image below). With the newer systems (see the second image below), the headset moves along with the head, so registration is maintained throughout the procedure, although frameless registration can also be performed. Therefore, any anesthetic technique may be used. 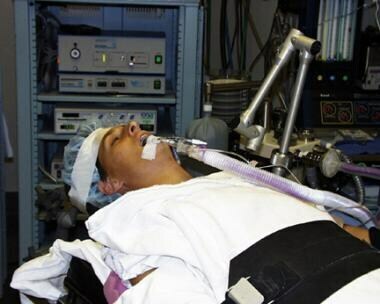 Old image-guided surgery (IGS) systems used an articulated arm (shown) and required the patient's head to be taped to the operating room bed. Current electromagnetic image-guided surgery (IGS) system (InstaTrak 3500 Plus, GE Medical Systems, formerly Visualization Technologies, Inc.). With an electromagnetic system, the headset that was worn by the patient during the preoperative CT scan acquisition is again applied on the patient's head in the operating room. This correlates head position with the tracking system. Accuracy is verified by testing various known landmarks on the patient's face and intranasally to the images on the computer monitor (see the image below). These locations' coordinates are stored and used throughout the procedure to monitor any changes in the accuracy of the device. With most systems, these preliminary steps take less than 2 minutes with the collaboration of trained operating room staff. Once registered and verified, the system allows the surgeon to verify surgical position on the monitor depicting the preoperative CT scan in 3 dimensions, along with an additional frame displaying the endoscopic view of the procedure (see the image below). Surgeon's view of the computer monitor showing the sagittal, axial, and coronal depictions in real time of the surgery progress. The fourth window can be either the real time video or a computer 3-dimensional rendition of the surgical field. These localization maneuvers should be performed with diagnostic instruments, not surgical instruments. 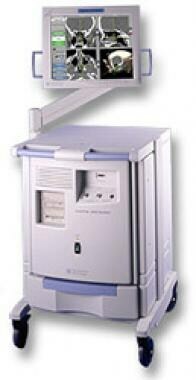 The use of a microdebrider with tracking is of exceptional benefit while removing nasal and sinus polyp disease. The authors' experience has been with an electromagnetic system. Metson et al prospectively compared an optical system and an electromagnetic system. Despite a significant decrease in operating time with the optical system, this difference was not readily explained. Furthermore, no significant difference was noted in other parameters (eg, blood loss, complications). Recent advances have allowed magnetic resonance images (MRI) to be fused directly to CT images. 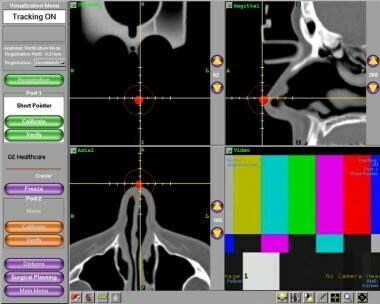 This technology is beneficial in cases that involve both otolaryngologists and neurosurgeons, as one image-guidance system can be used for navigation. CT images are indeed able to better delineate the bony anatomy of sinonasal cavities for the nasal approach performed by the otolaryngologist, whereas the neurosurgeon will require the assistance of MRI guidance with enhanced intracranial soft tissue definition to pursue the combined procedure. This is particularly relevant in cases that involve the pituitary and anterior skull base. The image-guidance system can create a hybrid image that has both excellent soft tissue and bony detail. Newer methods are available for automated registration; for instance, small cranial pin transmitters designed to replace the more bulky headsets currently in use may have exceptional benefit in open skull base or orbital cases. Future developments in surgical simulation will also likely contribute to broaden the applications of image-guided surgery. Patient-specific preprocedural rehearsal devices will allow surgeons to add critical annotations and observations to the imaging data set preoperatively. These annotations will then be available in real-time on the IGS system during surgery. Kanai K, Okano M, Haruna T, Higaki T, Omichi R, Makihara SI, et al. Evaluation of a new and simple classification for endoscopic sinus surgery. Allergy Rhinol (Providence). 2017 Oct 1. 8 (3):118-125. [Medline]. [Full Text]. Fried MP, Morrison PR. Computer-augmented endoscopic sinus surgery. Otolaryngol Clin North Am. 1998 Apr. 31(2):331-40. [Medline]. Dalgorf DM, Sacks R, Wormald PJ, Naidoo Y, Panizza B, Uren B, et al. Image-guided surgery influences perioperative morbidity from endoscopic sinus surgery: a systematic review and meta-analysis. Otolaryngol Head Neck Surg. 2013 Jul. 149(1):17-29. [Medline]. Ramakrishnan VR, Orlandi RR, Citardi MJ, Smith TL, Fried MP, Kingdom TT. The use of image-guided surgery in endoscopic sinus surgery: an evidence-based review with recommendations. Int Forum Allergy Rhinol. 2013 Mar. 3(3):236-41. [Medline]. Lusk R. Computer-assisted functional endoscopic sinus surgery in children. Otolaryngol Clin North Am. 2005 Jun. 38(3):505-13, vii. [Medline]. Fried MP, Moharir VM, Shin J, et al. Comparison of endoscopic sinus surgery with and without image guidance. Am J Rhinol. 2002 Jul-Aug. 16(4):193-7. [Medline]. Kacker A, Tabaee A, Anand V. Computer-assisted surgical navigation in revision endoscopic sinus surgery. Otolaryngol Clin North Am. 2005 Jun. 38(3):473-82, vi. [Medline]. Rathgeb C, Anschuetz L, Schneider D, Dür C, Caversaccio M, Weber S, et al. Accuracy and feasibility of a dedicated image guidance solution for endoscopic lateral skull base surgery. Eur Arch Otorhinolaryngol. 2018 Apr. 275 (4):905-911. [Medline]. Dadgostar A, Okpaleke C, Al-Asousi F, Javer A. The application of a free nasal floor mucoperiosteal graft in endoscopic sinus surgery. Am J Rhinol Allergy. 2017 May 1. 31 (3):196-199. [Medline]. Fried MP, Parikh SR, Sadoughi B. Image-guidance for endoscopic sinus surgery. Laryngoscope. 2008 Jul. 118(7):1287-92. [Medline]. Metson RB, Cosenza MJ, Cunningham MJ, et al. Physician experience with an optical image guidance system for sinus surgery. Laryngoscope. 2000 Jun. 110(6):972-6. [Medline]. Fuoco G, Chiodo A, Smith O, et al. Clinical experience with angulated, hand-activated, wireless instruments in an optical tracking system for endoscopic sinus surgery. J Otolaryngol. 2005 Oct. 34(5):317-22. [Medline]. Fried MP, Kleefield J, Gopal H, et al. Image-guided endoscopic surgery: results of accuracy and performance in a multicenter clinical study using an electromagnetic tracking system. Laryngoscope. 1997 May. 107(5):594-601. [Medline]. Metson R, Gliklich RE, Cosenza M. A comparison of image guidance systems for sinus surgery. Laryngoscope. 1998 Aug. 108(8 Pt 1):1164-70. [Medline]. Leong JL, Batra PS, Citardi MJ. CT-MR image fusion for the management of skull base lesions. Otolaryngol Head Neck Surg. 2006 May. 134(5):868-76. [Medline]. Brown SM, Sadoughi B, Cuellar H, et al. Feasibility of near real-time image-guided sinus surgery using intraoperative fluoroscopic computed axial tomography. Otolaryngol Head Neck Surg. 2007 Feb. 136(2):268-73. [Medline]. Fried MP, Topulos G, Hsu L, et al. Endoscopic sinus surgery with magnetic resonance imaging guidance: initial patient experience. Otolaryngol Head Neck Surg. 1998 Oct. 119(4):374-80. [Medline]. In this image, the surgeon is attempting to localize the right sphenoid sinus during image-guided surgery. The cross-hairs are clearly located on the right sphenoid sinus.